As part of the community partnership between Umm Al-Qura University, represented by the University College in Adham, and the Adham General Hospital, and in order to educate the female affiliates and students of the University College in Adham about the importance of premarital medical examination, the UQU Vice Presidency for Female Student Affairs in Adham will hold an educating seminar entitled, "The Importance of Early Premarital Examination". 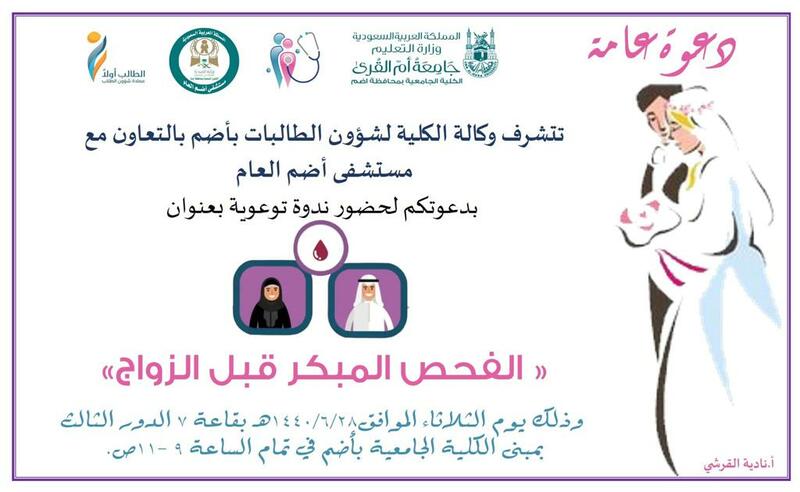 The seminar will be presented by a specialized female physician from the Adham General Hospital on Tuesday, 28 Jumada Al-Thani, 1440 A.H., in hall no. 7, on the third floor at the headquarters of the University College in Adham (female section).